Arnaldo Roche-Rabell, internationally known as one of the leading artists from Puerto Rico, actually launched his career in Chicago. While living there as an art student, he began showing his work in university galleries and alternative spaces. At one of those shows in the Art Institute of Chicago he took a first prize of $5,000, which he used for his master’s degree tuition at the institute. That was in 1984. 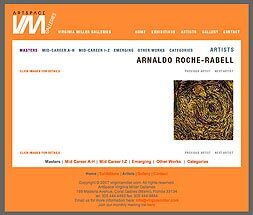 Today Roche-Rabell is represented in dozens of stellar collections, including those of the New York’s Metropolitan Museum and Museo del Barrio, the Hirshhorn Museum in Washington, the Art Museum of the Rhode Island School of Design, the Indianapolis Museum of Art, Houston’s Museum of Fine Arts, the Art Institute of Chicago, and other leading museums in Mexico, Venezuela and Puerto Rico, along with important private collections such as Chase Manhattan Bank and Carson, Pirie, Scott and Company in Chicago. His work has been exhibited in major museums and leading galleries throughout the world. A recent solo exhibition, “Fraternal: The Bridge Between My Brother and Me,” was shown at Virginia Commonwealth University, the Pennsylvania Academy of the Fine Arts, the Nevada Musem of Art, and the Kranner Art Museum at the University of Illinois.